For every season, there is a reason. December explodes with festivities, celebrations and anticipation. It also can be a time of inner reflection and looking ahead to the New Year. December invites us to give and receive, be it in the form of food, gifts or getting together with family and friends. 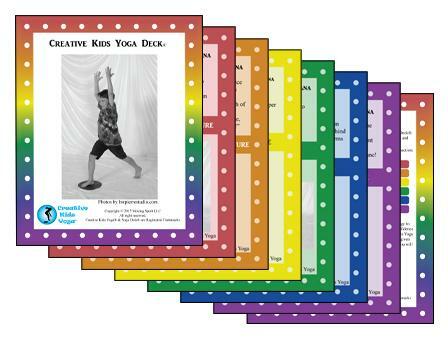 With this in mind, I am calling all parents, grandparents, aunts, uncles, teachers, caregivers, healthcare providers to take advantage of my “Rainbow Special”, brand new, hot off the press… Creative Kids Yoga Deck©! What is the Creative Kids Yoga Deck©? The deck has 38 cards, 2 cards explain how to use the deck. The rest of the deck is divided into 6 categories: Stretching, Strengthening, Energizing, Grounding, Balancing and Calming, with 6 yoga postures, pictures and movement experiences in each category. How to use? For example: When things are chaotic and you wish to bring children to a quiet place you might decide to explore any or all of the 6 calming postures. The beauty… it takes only a few minutes to redirect the kids, so not to disrupt your daily plans. 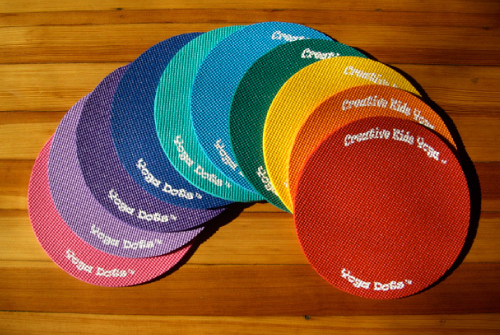 The best news is that we are offering you a 10% “Rainbow of Savings” when you purchase the Creative Kids Yoga Deck© or our magical Yoga Dots©. Just enter the code “RAINBOW10” at checkout to take advantage of our exclusive offer. An even bigger savings of 15% off, when you purchase the Creative Kids Yoga Deck© and one or more packages of Yoga Dots©… the two go hand in hand and fully support each other. Enter the code “RAINBOW15” at checkout for 15% off these two items. We invite you to take advantage of the Rainbow Savings now,because this special will end midnight, Sunday December 31st.